Heavy rain the past few weeks has kept the Gunpowder at higher flows, but fishable compared to other rivers in the Mid Atlantic. Last week anglers from Pennsylvania, New York, Delaware, Virginia, West Virginia, and New Jersey journeyed to the Gunpowder, since many rivers in those states were blown out. 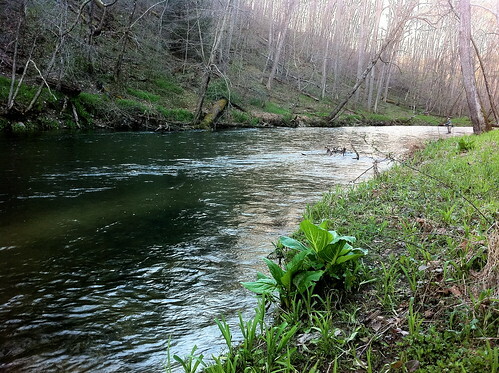 In a “spillover Spring” the frequent rain storms will raise flows on the Gunpowder, but the river remains clear. The higher water last week was producing results for anglers using big streamers, but I could only get chases from a few bruisers I’ve been targeting. This week flows leveled out at 137 CFs, and water temps have risen to 60 degrees. The hot air temperatures and warm spillover have certainly raised water temps, and jumpstarted numerous hatches. A variety of mayflies can be seen hatching on the river during the day, and returning to the water at dusk. Hendricksons, quill gordons, march browns, and the occasional sulphur can be seen through late afternoon. The numbers may vary from a few bugs to a few dozen over a couple of hours. 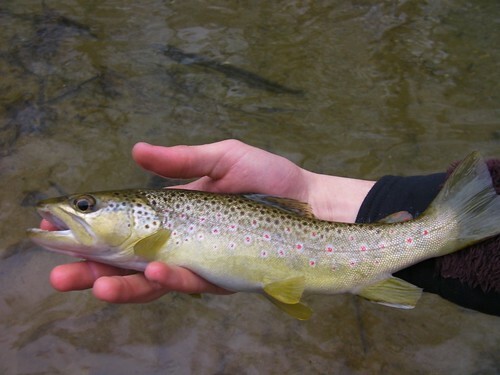 Many anglers reported that the trout were taking dries readily, even though there were only a few dozen bugs hatching. The afternoon emergence is prime time to search with dries, but for steady risers the action is at dusk. Stay late to catch the mayflies returning to the water, which may not happen until after 7:15 pm. The window may be brief, but the fish are often very aggressive. I fished the river yesterday, and spotted a half dozen sulphur duns fly off the water at 5 pm. The majority of mayflies I saw were hendricksons, and I caught ten in my hat, which was about a quarter of the duns I saw fly by me. When the duns flitted on the water too long before take off, the trout were hitting them. Nymphing or swinging wets is still a very effective way to catch fish. I spent some time turning over rocks, and found a lot of smaller mayfly nymphs in a size 16-20. The body color on these nymphs ranges from light tan to black. I also found larger size 14-16 nymphs, in addition to lots of caddis worms. The caddis worms ranged in color from a cream color to a chartreuse green. The trout were really hammering the caddis worm pattern I was using despite all the mayfly nymphs on the rocks. A few caddis were hatching alongside small craneflies and midges. Now that there are numerous insects hatching, the trout may be keying into certain insects at different times of the day. In this video post I turn over some rocks, film some mayflies, and release some feisty Gunpowder browns. This entry was posted in fishing report, video on April 26, 2011 by Jason du Pont. Please join us for a flyfishing school. On Sunday, May 1, a Backwater Angler Guide will be teaching a fly fishing school that is ideal for beginners. If you’re planning on fly fishing in Maryland, or anywhere else for that matter, this course is a great introduction to the sport. The school covers knots, casting, gear, fly selection and an hour of on-stream instruction. Schools are held in a meadow overlooking the Gunpowder river by a Maryland state licensed and insured fishing guide. Class is held from 10:00 AM till 1:00 PM. Cost is $100 per person and includes the use of gear. A Maryland non-tidal fishing license and trout stamp is required and may be purchased prior to the class with check or cash at the shop. Class size is limited to 4 and pre-payment is required. Please give us a call at 410-357-9557 or drop us a line at info@backwaterangler.com to register. This entry was posted in events on April 25, 2011 by Theaux Le Gardeur. 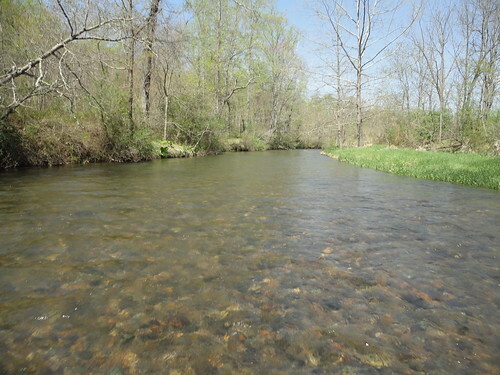 Recent stream reports are pointing to improving conditions on the Gunpowder. With each passing shower we’ve seen water levels on the river stay consistently high and clear. Water temps are also right on the money at 54 F by late afternoon so we’re seeing a mix of Hendricksons in the #14 range and a few #12 March Browns. Dark bodied bead head nymphs and weighted soft hackle patterns in the #14-16 range are a good bet in the riffles. I spent a great day in the shop and a nice evening on the water with our Spirit River rep this past Thursday. He tricked a heavy 15″ brown out of a log jam on an olive bead head zonker pattern and drove back to NJ smiling after flyfishing the Gunpowder river. Thanks to Skye and Ron for the stream reports. Thanks for the tips before I headed out to try my luck. Your advice was right on the money–the Hendricksons (around size 14) started flitting about and alighting on the water around 2pm. I put on a heavy hackled pattern I picked out of the muffin tin last week. It wasn’t long before this gorgeous brown erupted out of a seam and engulfed the fly. He put up a nice fight and was gently released. Before he swam off I was able to snap an underwater picture of his recovery. Spring has sprung! Caught this brown using the 6.5′ 4wt Little Falls Bamboo.Great fun getting him in. He ate a caddis emerger Jason sold me the other day. Please Note: The shop will be closed on Easter Sunday! 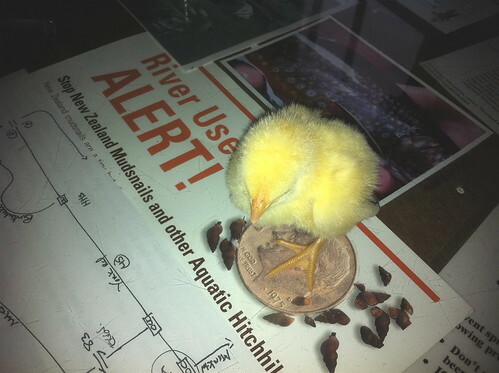 This peep was not harmed during the writing of this stream report! This entry was posted in fishing report on April 23, 2011 by Theaux Le Gardeur. Theaux, It’s a beautiful spring day, I can hear a Mockingbird singing in my Live Oak tree in the backyard and all I can smell is burning oil. Son, I know you’re coming home in a month, but I can’t tell you if we’ll have any oysters left by the time you get here. -I can’t bear to see one more oiled brown pelican. As I speak to my family members in Louisiana and how the spill is affecting them, I’ve become increasingly aware that we don’t yet know what we’ve really lost along the Gulf Coast because we currently do not have a pool of accurate, federally supported, baseline environmental monitoring data to rely on. How can we tell BP what we’ve lost if we don’t have the whole picture of what all of our coastal resources are worth? It was a watershed moment for me. Over 1,100 miles away, I felt a pressing need to do my part for a river system I have based my livelihood on for 9 years. Now I find myself conducting baseline monitoring throughout the Gunpowder watershed to afford it more protection. The spill became the catalyst behind Gunpowder RIVERKEEPER®. One year later I appreciate that many have taken the initiative to reach out to those affected by the spill while the hard-working people in the region are still recovering and rebuilding from the chaos that the Katrina/Rita duo dished out. This entry was posted in news on April 20, 2011 by Theaux Le Gardeur. This past weekend hendricksons and quill gordons started hatching on the Gunpowder. On Sunday I saw a few dozen while guiding on the river, but on Monday the 80 degree air temps brought on a steady hatch. I didn’t stay until dark to see the spinners returning to the water, but I did catch a few browns on a hendrickson dun in the riffles. Stoneflies were also flying around in enough numbers that they brought splashy rises when they hit the water. I even saw a few caddis hatching in small numbers. The water temperature spiked to nearly 54 degrees on Monday, and rain caused the river to rise today. Flows are still climbing, and the current level is 165 CFs. The past two weeks anglers have had success nymphing midge patterns and small nymphs. Swinging nymphs is always an easy way to catch fish now that mayflies are hatching. Pheasant tails (minus soft hackle) were resulting in inadvertent catches, when clients lifted the flies to the surface at the end of a drift. Streamers are working well in these flows, and will likely produce bigger browns than dries or nymphs. Josh and Mike caught numerous browns on Zonkers last Sunday, including the brown above. The shop just received a shipment of hendrickson duns, both snow shoe and traditional variations. We have emergers, light and dark hendrickson patterns, as well as spinners. If the rain and warm weather continue over the next weeks, it is likely we will see sulphurs hatching alongside hendricksons. The spillover adds warmer water, and generally gets the bugs hatching weeks earlier than normal. Last year I saw my first sulphur on April 15th, and hit a good spinnerfall on the 20th. The current conditions are similar to last Spring, so carrying a few sulphur patterns may be a good idea in the coming weeks. This entry was posted in fishing report on April 12, 2011 by Jason du Pont.